Tonight’s Achievement was exciting because it was something I had never done before and it looks fantastic. Hopefully when it cools, it will taste as good as it looks! I’ve never baked bread before. 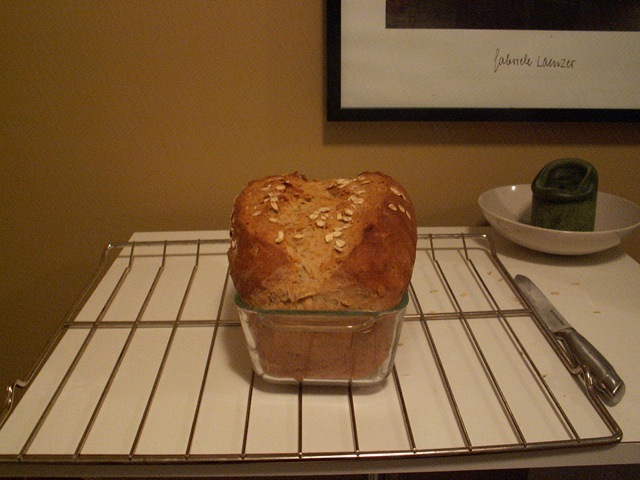 It was a surprisingly long process., particularly since I don’t have a bread maker. But I think it was worth it. 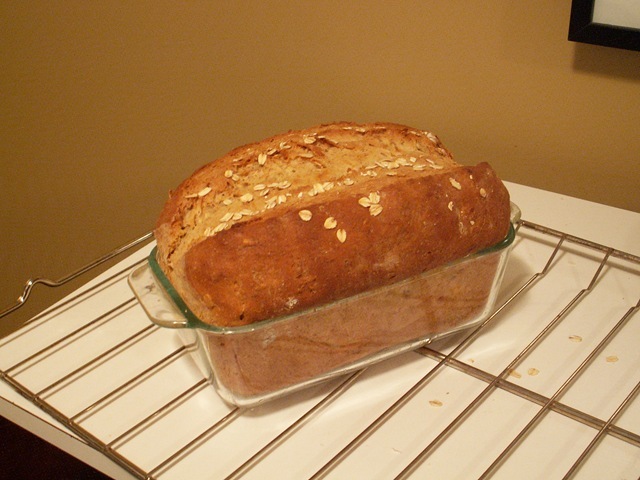 Bread-baking is one of the most satisfying of endeavors; there are so many factors involved in its success — so many things that could (and do) go wrong — and the reward for even moderate success is so “acceptable” that one vows (in vain) never again to be satisfied with wimpy, tasteless store-bought loaves. I know this is just so obviously true that it’s hardly worth writing down. It is also one hell of a lot easier than reaching a satisfactory resolution of difficult issues of Greek grammar. Isn’t it fun? It was one of my favorite ways to take a break from studying when I was in grad school. Now we don’t ever buy bread, we just make it. No bread machine, either; it turns out too tough and dries out within a day. Prof. Conrad and James: It sure is a much longer process than I anticipated, but well worth it. I’m thinking that I want to continue making bread once a week or so, which won’t be enough to completely prevent going to the store, but it will still be better. I couldn’t resist that last note: the Corinthian congregation was asked: οὐκ οἴδατε ὅτι μικρὰ ζύμη ὅλον τὸ φύραμα ζυμοῖ; I fear that it may require more than μικρὰ ζύμη to raise up a dead language for many of us — but, of course, that’s ἀνίστασθαι, not ζυμοῦν.